Mary Crabb was sitting at her living room table in suburban Hertfordshire, England, staring into a laptop. “Hello,” she exclaimed with a smile and a hint of nerves as she greeted the man who was staring back at her. “Hello, how are you?” the man replied from 5,000 kilometres away. And so began a conversation 77 years in the making, the culmination an emotional roller-coaster for Crabb that took off again in recent weeks. “I’ve cried many times,” Crabb told Harry Curtis, the son of a Canadian soldier who helped save her life within hours of her birth in 1941. “If you’re like me right now, you’ve had lots of thoughts running through your head,” Curtis told her from his home in Stittsvile, Ont., southwest of Ottawa. Crabb has known for much of her life that she was adopted as a baby. It was only after her adoptive parents died, however, that her family dug into her past. The family’s research revealed that on Sept. 23, 1941, Crabb’s birth mother had abandoned her as a newborn. The baby was left hidden in blackberry bushes in Horsell Common, a 355-hectare park on the outskirts of London. She was blue and clinging to life. Then three Canadian soldiers came along and saved the day. “I owe my life to them,” Crabb, 77, told CBC News. Stationed in England during the Second World War, the three Royal Canadian Artillery (RCA) members happened to be nearby at the time. Their regiment was out on manoeuvres, part of preparations in the event of a German invasion. The men heard a noise from the bushes and went to investigate, according to media reports at the time. They “thought it was a chicken,” Crabb said. To their surprise, the soldiers found the baby, cut the remaining umbilical cord with a knife and wrapped the girl in a white shirt. 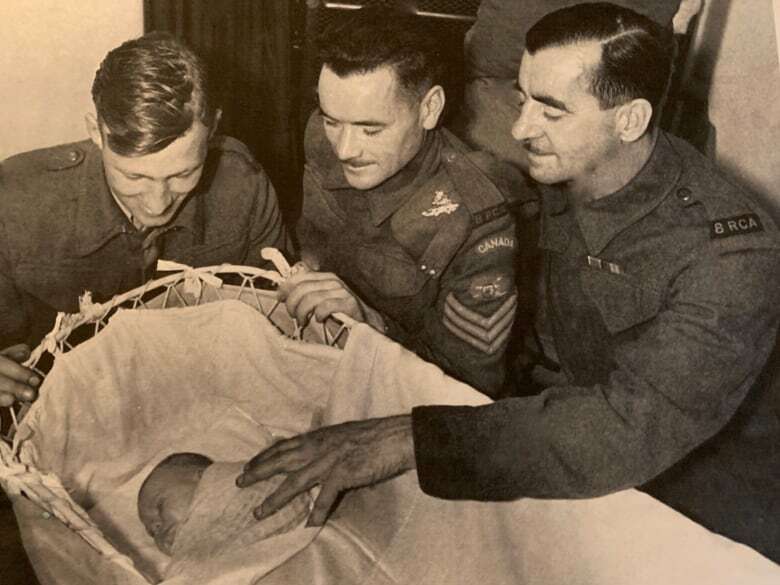 On Dec. 31, 2018, Crabb’s nephew told her he had found a new clue about her past — a photograph showing her as a baby in a British hospital, surrounded by the three Canadian soldiers she never got to thank. “Tears were running down my face to think that was me,” she said. Crabb’s nephew, Graeme Elliot, took to social media, posting the picture — first published in London’s Daily Mirror in 1941 — in search of family members of the Canadian soldiers. It wasn’t long before Harry Curtis was shown the post and both families started organizing a reunion of sorts. “My wife saw the picture on Facebook and said ‘Oh my God, I recognize that picture … there’s your dad,” Curtis said. His late father, Sgt. Ernie Curtis, is seen in the middle of the photo wearing his RCA uniform. 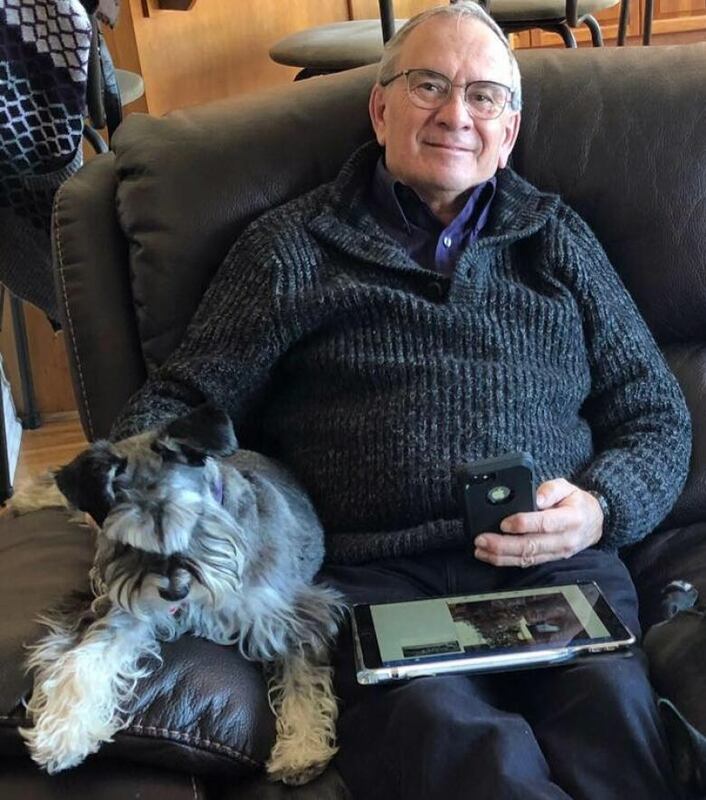 This week, the long-lost connection was rekindled when Harry Curtis reached Crabb using FaceTime on a laptop supplied by CBC News. “It’s a miracle, really, isn’t it?” Crabb said. They chatted about their respective families. Crabb has one grandchild, Curtis has six. They promised to keep in touch. Curtis even plans to send Crabb the epaulettes from his father’s RCA uniform. The extraordinary encounter made headlines in both Britain and Canada in 1941. The Daily Mirror reported the soldiers intended to adopt the baby as a “daughter of the regiment,” naming her Virginia Regina Brandon after their hometowns. “The child was rushed to an army truck” and then taken to hospital, according to a piece in Regina’s Leader-Post on Nov. 5, 1941. Within months, the girl was adopted by an English couple and given the name Mary. She grew up in Hertfordshire, 65 kilometres from where she had been dumped as a newborn. Crabb only learned much later in life that her birth mother had pleaded guilty to abandonment and was reportedly sentenced to two months’ probation. At the time, the Mirror identified the three soldiers as Gunner Brackett, Sgt. Curtis and Gunner Griffin. Susan Griffin, who lives in Massachusetts, told CBC News her father, Bob Griffin, is the man on the left of the 1941 photo. CBC News has not, however, been able to formally name the third soldier, identified in various media reports as A.J. Brackett or E.J. Brackett. Crabb acknowledges she’s still learning about the first days of her life, all these years later.